(This information is compiled from available sources, including press releases by the Tokyo Electric Power Company (TEPCO) and the International Atomic Energy Agency (IAEA)). At 0136 EST on March 12, 2011, a “vertical earthquake” resulted in an explosion at the Fukushima Daiichi Unit 1. Other units at Fukushima Daiichi and units at other sites were not impacted by this earthquake. 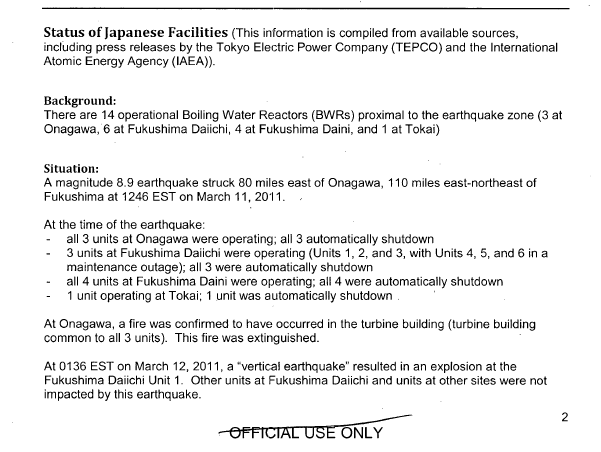 Explosion occurred at Unit 1 following 0136 EST (March 12, 2011) earthquake. This explosion was due to hydrogen.